Naples Park Barber Shop will be honoring Veterans on November 11, 2016. 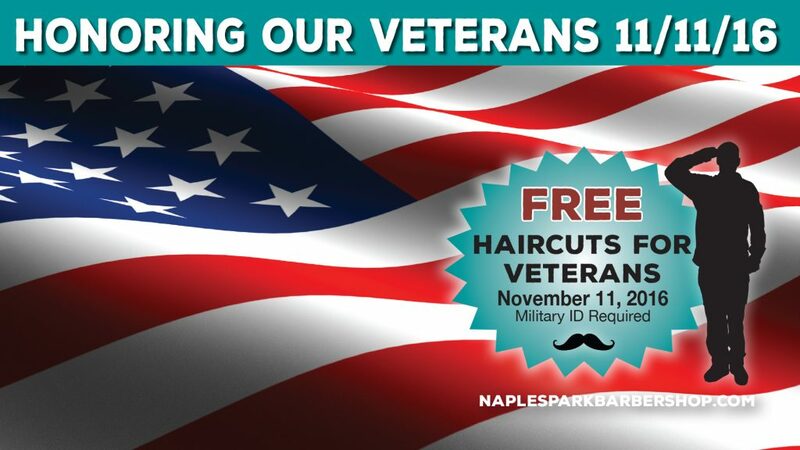 Naples Park Barber Shop will be giving back to active servicemen and veterans in all military branches with a free haircut to thank them for their service on Veteran’s Day. Naples Park Barber Shop is a full-service barbershop offering haircuts, straight razor shaves, and men’s color services. The shop has a staff of four expert and master barbers whose services include haircuts, shampoos, color blending, moustache and beard trim, and stately shaves with hot towels and balm. It also offers complimentary Wi-Fi for all customers. Clients also enjoy professional hair styling in the state-of-the-art leather chairs with pulsating heat for the back, while one of the experienced barbers applies hot towels for the ultimate in relaxation. They even complete the trim by lathering warm shaving cream on the back of the neck, to provide the closest shave for that clean-cut look. TV’s highlight the day’s best sports. Naples Park Barber Shop is located at 881 103rd Ave North, Unit 3, Naples, FL 34108. Reservations can be made via Google or Apple Apps or by calling (239) 596-6454. Visit www.NaplesParkBarberShop.com for additional information.